Today we have the honor interviewing author Suzanne Woods Fisher. By the end, you’ll know more about her – personally, spiritually and professionally! Suzanne, thank you for taking time out of your busy schedule to allow us to peak into your life for a bit. DA: You have mentioned that your grandfather was raised Plain. Was he raised Amish? SWF: My grandfather was one of eleven children, born into a German Baptist (or Dunkard) family in Franklin County, Pennsylvania. The Dunkards could be considered cousins to the Amish – they are Anabaptists (baptized as adults), with a similar theology to the Amish and the Mennonites, and share many core values. DA: Why did he decide to leave the Plain life? SWF: The Dunkards do not practice “shunning” (actually, only the Amish practice shunning as a church discipline, and only after one has been baptized). Although my grandfather was raised in a farming family, he had an intellectual bent. He became a schoolteacher (one room schoolhouse) and then went to Penn State to major in Agricultural Economics. He did “farming reports” for KDKA Pittsburgh (first radio station in the country). I think his path was set after that – he never returned to farming, though he maintained a very close relationship with his siblings. DA: You have said that you have a great admiration for the Plain people and that one does not have to ‘go Amish to incorporate many of their principles into [life].’ How do you personally incorporate Amish values into your daily living? SWF: On a practical level, I try to make decisions based on principles of simplicity. Doing so helps me clarify complicated issues and distill them down to their essence. The curious thing is that simple living looks different for everyone. For example, we lived in Hong Kong for four years – a crowded, vertical city! And yet it became a time of great simplicity for our family. We kept family life honed to the basics: what was easy, doable, and kept us close together. DA: You have family that were raised Plain, and I know you visit the east frequently for research. Do you think that the Englisch romanticize the Amish and their way of life? SWF: The Amish are either romanticized…or skewered! Nothing in between. I think they would prefer to be viewed as imperfect people who love God. As for those who romanticize them: some of that comes from the Amish’s rural life, with a heightened view of nature. Some of it comes from the deep community that surrounds them. As for those who skewer them (and I get plenty of emails from those people) – they accept media misconceptions as truth, they believe there is a one-size-fits-all for the Amish, and they can’t see another culture without applying their own filter over them. DA: Congratulations on the newest addition of your family! Give us the details! SWF: Thank you! Madeline Claire was born on October 3rd to my son and daughter-in-law, and she is adorable! Only complaint her parents have is that she sleeps all day and is awake all night. They are exhausted! DA: You often mention how important prayer is to you. Of course, it should be so for everyone, but why is it for you? Did you have a “watershed moment” that made prayer a priority in your life? SWF: Great question! Have you ever noticed what the first recorded words are of God in the Bible? You’ll find them in Genesis 1: “Let there be light.” Those are powerful words! For me, so much of prayer is God shedding light on my thoughts, my actions, my choices, my life. DA: Why do you think prayer is important? SWF: Prayer is such a gift and such a mystery – why would the living and sovereign God of this massive universe want to hear from us?! And yet, Scripture tells us that He longs to be in constant conversation with us. “From heaven the Lord looks down and sees all mankind; from his dwelling place he watches all who live on earth – he who forms the hearts of all, who considers everything they do” (Psalm 33:13-15, NIV). DA: When did you discover your love for writing and what was the first work your wrote and thought, “Ah, I really can write!”? SWF: Still waiting for that moment! But I have always loved to write. I don’t remember a single teacher (or my parents, either) who noticed my writing as exceptional. It was a strength for me (way more so than math! ), but what drives me is a passion to write, and to write well. I don’t think I’m a gifted writer. Just a hard working writer! DA: You have a new book, The Devoted, that just released. I read it and absolutely LOVED it! (Readers see review here.) For those that haven’t read your Bishop Family series yet, this is the third and final book in the series. Who is your favorite character in The Devoted and why? SWF: David Stoltzfus! He’s inspired by an Amish bishop I’ve had the privilege to know, and I really enjoyed how David had those “aha” moments in Scripture, to help him clarify a sticky situation (See? Another variation on the theme of “Let there be light!”). DA: What predominant truth do you want readers to come away with after reading The Devoted? SWF: There’s a couple of different truths in Devoted: When is enough, enough? Cherishing time. Don’t confuse wanting to matter with what really matters. And maybe the best of all: Without God, the Promised Land is nothing. DA: What are you working on for your next writing project? SWF: My next two releases are historical fiction about the first Amish who came to America. The Amish Beginnings series started with Anna’s Crossing as a stand alone, but readers wanted more! In February, The Newcomer continues Anna’s story. Later in the summer, The Return concludes the series. DA: Thanks again for stopping by! It’s so wonderful getting to know you better. SWF: Thank you! 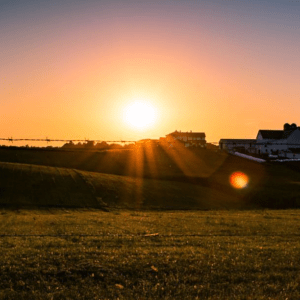 I’m grateful for Destination Amish – how it connects readers and authors and interests in common. Okay, readers! 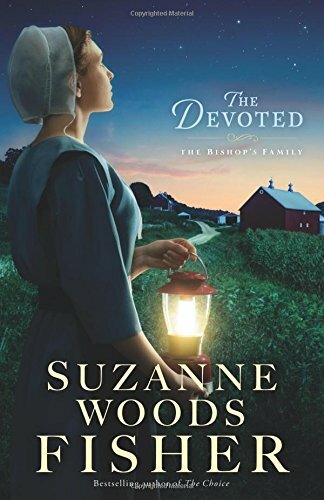 Comment below and tell us what your favorite Suzanne Woods Fisher novel is for an opportunity to win an autographed copy of The Devoted! Winner will be chosen November 8, 2016. Suzanne Woods Fisher has a specialty: she writes about real people living in faith-based communities. With over 750,000 copies of books sold worldwide, she is the bestselling, award-winning author of more than twenty-five books, ranging from children’s books (‘The Adventures of Lily Lapp’ series) to novels (“The Choice”) to non-fiction books (“Amish Peace: Simple Living for a Complicated World”). When Suzanne isn’t writing, she’s probably playing with puppies. 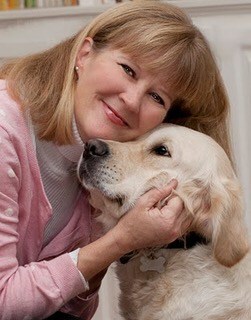 She’s been involved with Guide Dogs for the Blind for over fifteen years. Raising puppies, she says, is like eating a potato chip. You just can’t stop at one. I can’t really pick a favorite, because I love all the books by her. I have read most of them, but I still have a few to go. Interesting and informative interview. Would love to add this book to my collection. Thank you. Happy November. I have to say I love all of Suzanne’s books however the Bishop’s family was absolutely amazing! The entire series was great from book 1 through book 3. Suzanne was right to say her favorite character was David because mine was well. His compation for community, and his love of God was like no other! Thanks Suzanne for this wonderful series! I recently read “The Stoney Ridge” Season Series and Loved it! I can’t wait to start reading “The Bishop Family” series. I have The Imposter & The Quieting but haven’t bought The Devoted yet. I always wait until I have the complete series before beginning the first book. Guess I need to read Anna’s Crossing; it sounds to be very interesting. Will see if my library has it, I hope so. Thank you for an opportunity to win The Devoted. I love all of her books. I have especially liked reading the on going story line of Stoney Ridge. It is very interesting to see the characters continue on through the books. The Devoted is a favorite. I love David Stoltzfus and found myself wishing I could actually have a conversation with him. Thank you for the opportunity to win her book. Hi everyone! Popping into say thank you for the interview, Susan, and thank you to the readers for the lovely words! I enjoy getting the feedback on the different characters–it helps me so much to see what (or who!) resonates with readers. This is a beautiful website, btw. Love the clean look of it! Grateful for all you do to connect readers and writers! We’re so thankful that you popped by, Suzanne! Wow That’s a hard on because I love all of your books so that makes it hard to pick just one. Thanks for all your great reads. Have a blessed day. Hi! My favorite book by Suzzane Woods Fisher is Anna’s Crossing. Knew it would never be a stand alone. Just too good and begs the reader to ask for more. Suzzane glad you are adding on to Anna’s Crossing. Thanks for agreeing to be interview here and for your most generous giveaway. I’m with you on that one, Shirley! When I read Anna’s Crossing, I was just HOPING that she would make that into a series!! would love to own that book. Thank you for this great interview with Suzanne, I really love all her books and cannot pick one favorite. Thanks to Suzanne for writing such great books for us to read and for this chance to win a copy of The Devoted from a great series. That’s like asking me to name my favourite child or grandchild. It can’t be done ! I love them all ! It is hard to pick just one. Enjoyed reading them all. I am reading The Letters right now. I love all of her books, but my favorite would have to be The Lesson. I have enjoyed The Bishop Family Series and can’t wait to read The Devoted. It is hard to pick a favorite as I love them all. I enjoyed the interview and have met Suzanne Woods Fisher. She is such a nice person and that comes through in the interview for sure. Thanks for the opportunity to win! Ah, Linda! What a treat! I hope I can meet Suzanne in person one day, too — maybe she’ll decide to do a book tour in the Atlanta area. A girl’s gotta have dreams!! I love all Suzanne’s books. I really enjoyed The Keeper. It was really hard to put down and I didn’t want it to end. I have a whole collection of your books and have read and love every one of them. I can’t pick just one. Thanks for sharing your talent. Also anxious to read The Devoted … I wanted to start reading it yesterday! I love Suzanne’s books. Am anxious to read The DEVOTED and would love to win a copy…the give away is on my birthday! and the CHARMING NANCY just happened to be THE SHIP, and that very same crossing, that carried my relatives to the USA, to start a new life! of the simple life or ways ! I have enjoyed many of her books and they are ones that I kept when I recently cleaned out my bookcase in preparation for moving! The Keeper is one of my favorites. The Devoted is my favorite. I would love to win it. Thanks for the lovely interview, Suzanne! The winner of a copy of The Devoted is Julie. Congratulations!